We're pleased to announce a new update to the Rappid library, version 2.2, full of updates, fixes, and some great new features. In particular, Rappid v2.2 adds two new plugins for editing and drawing lines and curves. This opens up all sorts of new possibilities for building apps with vector editing capabilities similar to what you can find in programs like Adobe Illustrator, Sketch, Inkscape and others. Combining these new capabilities with the additional features of Rappid, one can build full-fledged vector graphics editors and diagram builders where users can draw engineering parts, or simply add freehand sketching capabilities to flowcharting, workflows and other diagramming apps built with Rappid. New ui.PathEditor plugin for editing vector SVG paths. 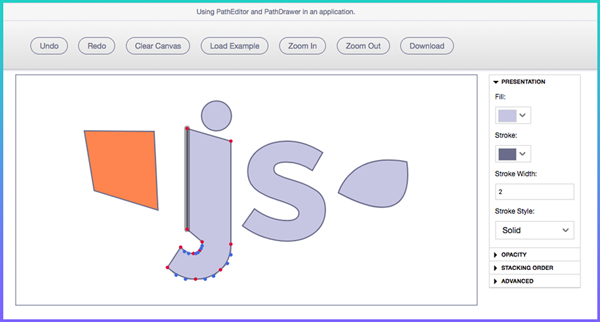 New i.PathDrawer plugin for drawing SVG paths. New Vector Editor demo app for PathEditor and PathDrawer, effectively implements a simple vector graphics editor. Rappid v2.2 is compatible with both Lodash v3 and v4. Download Rappid v2.2 and start editing vectors with ease, thanks to our new Vector Editor demo app. new VectorEditor demo app demonstrating PathEditor and PathDrawer - LIVE DEMO! automatic directed graph layout adds support for link labels - LIVE DEMO! We hope you you'll get the most from these new features, fixes and updates. Please don't hesitate to get in touch with questions or comments. All other Logos and Trademarks mentioned herein belong to their respective owners.